At Savaria, we like to hear about our end users and how our products are making a difference in their day-to-day lives. But when we heard about Loren and Joy from Illinois, we couldn’t resist turning their story into a full blown article. This couple purchased not 1, not 2, but 3 Savaria mobility products. Loren and Joy lived in a farmhouse in Jacksonville, Loren’s childhood home since the age of 6. Loren was an amputee and used a wheelchair. Sadly, he passed away recently at age 69. He lived in the farmhouse until he died. Throughout his life, Loren owned lowered floor minivans, adapted full-size vans, and curved stairlifts. 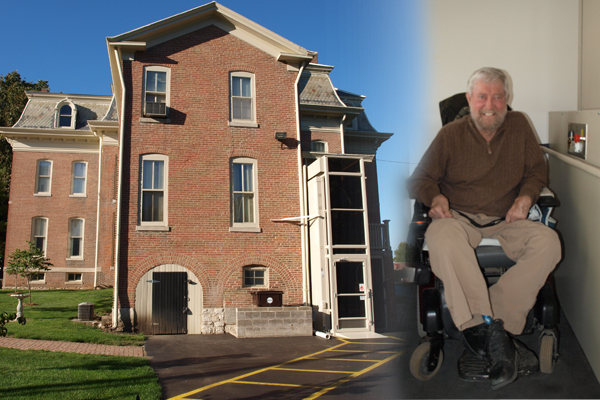 In 2005, the couple met with Savaria dealer, Personal Mobility, to purchase a residential lift. The first purchase was complete. A V-1504 Vertical Platform Lift was installed in their farm house. Chosen because of its durability and ease-of-use, the lift was a perfect fit for this couple. Loren was a woodworker, farmer, and overall a handy man, so he fashioned himself a rope handle for the platform gate that made it even easier still for him to enter the lift. Loren and Joy’s farmhouse was originally part of the Jacob Strawn home place. This property was one of two built by the same couple. The other was donated to the Art Association of Jacksonville in 1915 and was converted to become the David Strawn Art Gallery. With ties to the gallery, Loren spearheaded the purchase of the second V-1504 for the building. The lift was customized with a bronze plexi glass enclosure and provides access to the main floor, elevated 9 feet off the ground. The third product was purchased by Joy after Loren’s passing. Joy moved to a new home and though she is able-bodied, she recognizes the convenience of a home elevator and is planning for the future with her decision to install a Telecab. All of these installations were performed by Savaria dealer, Personal Mobility. Owners Gerry and LuAnn Davis got their start in the industry when their daughter endured brain damage from an asthma attack that turned into cardiac arrest. When researching alternatives for an accessible van, the couple decided to open a mobility company to provide access for families such as themselves. Eleven years later, this family run business, in partnership with United Access, is considered to be one of the top mobility centers in Illinois. We loved hearing Loren and Joy’s story and felt lucky to be a part of it. This wonderful couple faced physical barriers at times but they were quick to find solutions and adapt. They helped a beautiful art gallery become accessible and many will appreciate that in future years.